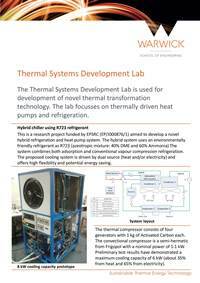 Warwick is at the forefront of research in adsorption refrigeration, heat pumps and air conditioning. Currently, there are projects running in such diverse fields as tri-generation from biomass in developing countries to waste heat driven car air conditioning and the development of gas fired heat pumps for domestic boiler replacement in the UK. The design of heat driven systems relies on optimising heat and mass transfer within them. This work has concentrated on optimising heat transfer through developing patented heat exchanger designs and working with materials suppliers to improve the characteristics of their products. Patents have also been awarded for novel system operating and design methods. We are continuing our innovative approach with research into new refrigerant mixes and hybrid sorption-compression systems. 4S-DHW (Small Smart Sustainable Systems for future Domestic Hot Water) (EPSRC). I-STUTE (Interdisciplinary centre for Storage, Transformation and Upgrading of Thermal Energy). Small Cooling Capacity Hybrid Refrigeration System using R723 (EPSRC). CALEBRE (Consumer-Appealing Low Energy technologies for Building Retrofitting) (EPSRC / Eon). Adsorption of metal salt - ammonia pairs modified by host matrices and additives (Royal Society). Reducing the carbon footprint of glasshouse production through the use of knowledge transfer and novel engineering solutions (DEFRA). Enhanced biomass production and energy conversion for use in water-scarce areas of India.